I love your rendition of Tweedle Dee and Tweedle Dum! Your depiction of their facial expressions captures their immense unearthly personalities. You definitely brought these two characters too life with your illustration. I hope to see more of these! Thanks for sharing! Wow! 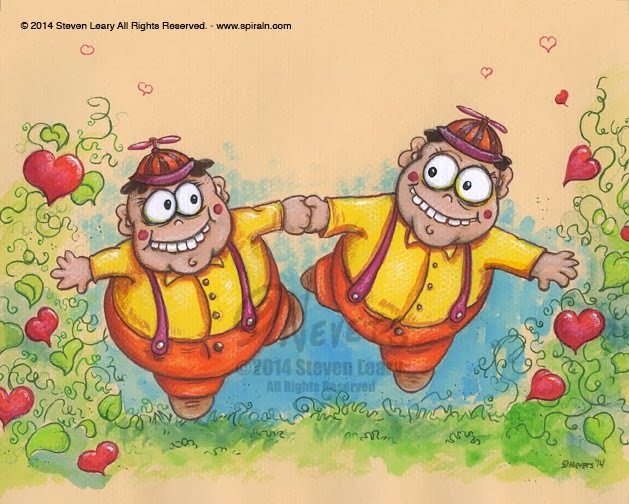 That's a very cute depiction of Tweedle Dee and Tweedle Dum. It brings back so much childhood memories. Hahaha! Your works are neat and beautiful with great color combination and perspective. They are simple, yet stunning. I'm looking forward to see more of those in the future. Thanks for sharing that, Steven! Kudos and more power to you!